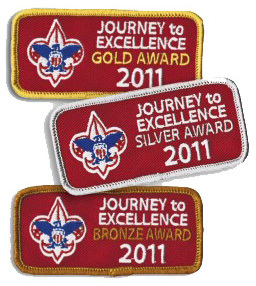 How many of you followed the new Journey to Excellence program in 2011? If you didn’t, I highly recommend it for 2012. JTE is an awesome tool to get your Troop, Team or Crew focused on goals that promote and sustain a highly functioning youth program! It provides a framework for planning, a method for evaluating and guidelines for doing what successful units do to improve. Better yet, if you are running your program the way you’ve learned through Roundtable, University of Scouting or Wood Badge, you are likely already doing much of what JTE promotes… so why not make it official and formally recognize your boys for their efforts! My troop earned Silver for 2011. Our strength grows every year as we continue to work on building an active program. For example, we already camp every month, we have near-100% attendance for week-long scout camp, we operate under a budget, we hold a Court of Honor quarterly, we perform regular service and we’re getting better at using the Patrol method. So exercising this program the way it was designed has been somewhat natural and easy. Where we struggle and fall short is getting adult leaders to attend training – they don’t think this is necessary or important for some reason. Of course there’s always room for improvement in every category and JTE has definitely helped guide us and provide focus throughout the year. Some critics may insist that performance metrics calculated by JTE does not measure quality. While that may be true, I believe that doing the work as organized by JTE automatically drives a troop in the direction of quality. …and that’s where I see the power of this program. So the year has just begun! Make some scouting goals for 2012 using JTE. If your unit needs a spark to catch the vision, perhaps you can make this a friendly competition among your scouts. Throw out a challenge to your Scout Troop, Varsity Team or Venture Crew to see who can accomplish what they set out to do this year. That’s how my Troop is going to approach this as we go for the Gold! For everything you need to know, or download about JTE, visit the Journey To Excellence page on Scouting.org. There’s a targeted set of goals for every family of scouting! 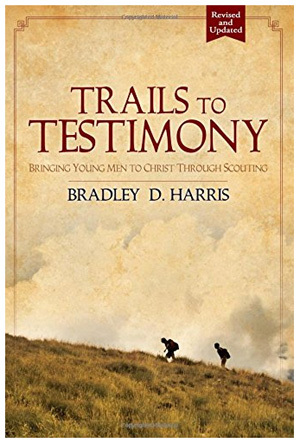 This entry was posted in Awards, Journey To Excellence and tagged boy scouts, bsa, goals, journey to excellence, jte, roundtable, scout troop, university of scouting, varsity team, venture crew, vision, wood badge. Bookmark the permalink.